After just three hours of play here on Day 4 of Event #58: $1,111 Little One for One Drop, Brian Yoon has defeated seven other competitors to take down the gold bracelet and $663,727 in prize money. He just knocked out Cuong Van Nguyen on the 11th hand of heads up. Van Nguyen will have to console himself with $408,624. Player wasted no time jamming chips into the middle to start the day, when Van Nguyen doubled through Alex Case on the very first hand. Case was eliminated a short time later. Kevin O'Donnell followed just a few hands later in seventh. Joe Morneau busted sixth when he couldn't hold off Yoon's draw. 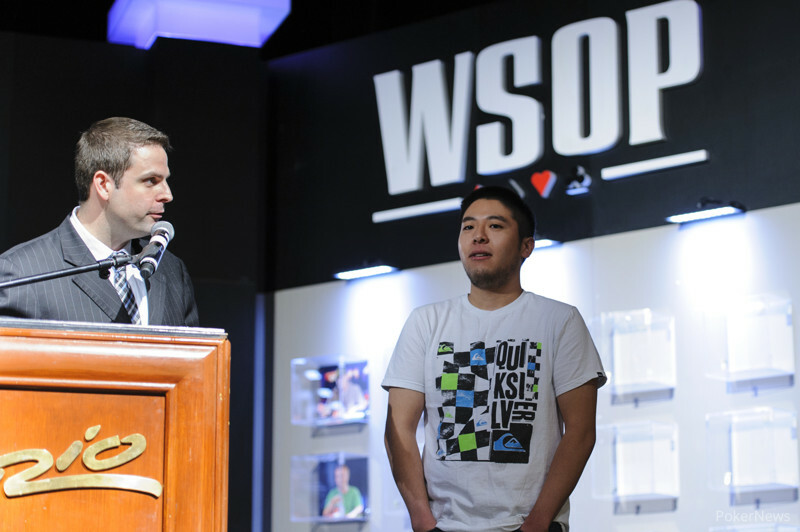 Yoon jammed another draw a short time later, this time against Day 3 chipleader Nghi Tran. He spiked his straight on the turn, propelling him to a dominating stack. A crippled Tran busted a short time later. The players sparred four-handed for awhile before Yoon claimed another victim, ousting Justin Zaki in a flip. Roland Israelashvili fell the very next hand in third, leading to the short heads-up battle. 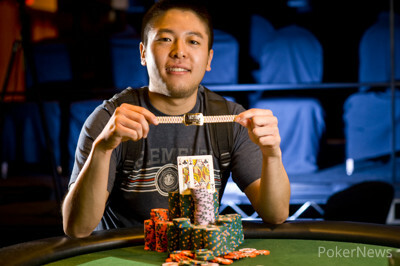 Yoon's win triples his career live tournament earnings. Thanks for tuning in to our One Drop coverage, and congratulations to Brian Yoon. Don't forget to jet on over to the live reporting for the Main Event. Hand #118: Cuong Van Nguyen raised to 450,000, and Brian Yoon shipped all in. Van Nguyen made the call for around 3 million. The flop came , and Yoon was suddenly a bit behind and in danger of being in an even-stacked heads-up match. The turn was a , which changed nothing. "Seven!" yelled one of Van Nguyen's greedy railbirds. Instead, the river was the , and Yoon had spiked one of the cards he needed to take down the tournament. Hand #113: Brian Yoon raised to 325,000 on the button, Cuong Van Nguyen defended his big blind, then check-folded to a bet from Yoon on the flop. Hand #114: Brian Yoon received a walk. Hand #115: Brian Yoon raised to 325,000 on the button and Cuong Van Nguyen folded his big blind. Hand #116: Brian Yoon received another walk. Hand #117: Brian Yoon raised to 325,000 on the button and Cuong Van Nguyen defended his big blind. The flop came down and Van Nguyen check-called 350,000 from Yoon to see the turn. It was more of the same as Van Nguyen check-called 600,000 from Yoon this time, landing the river. 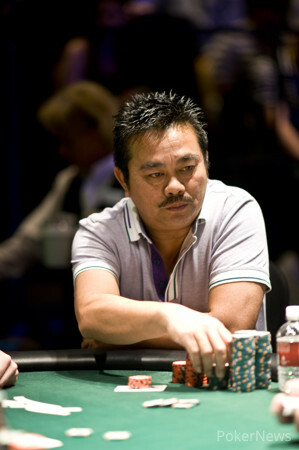 Both checked and Yoon tabled for two pair, Van Nguyen mucked, and Yoon took down the pot. Hand #108: Cuong Van Nguyen moved all in, Brian Yoon folded. Hand #109: Brian Yoon raised to 325,000, and Van Nguyen pushed all in again. Yoon folded. Hand #110: Yoon again folded to an all in. This time, Van Nguyen showed . Hand #111: Yoon raised to 325,000, and Van Nguyen continued his aggressive strategy with another shove. Yoon folded. Hand #107: Brian Yoon raised to 325,000 in the cutoff (there was a dead small blind), and Roland Israelashvili jammed from the big blind for about 2.2 million. Yoon called. The board ran out , and Israelashvili bowed out in third. Before the start of the WSOP, Doyle Brunson announced he would not play any events. He tells Kristy Arnett why he made that decision, and in the end, why he couldn't resist the $50,000 Poker Players Championship and the Main Event. Hand #103: Roland Israelashvili received a walk in the big blind. Hand #104: Brian Yoon received a walk in the big blind. 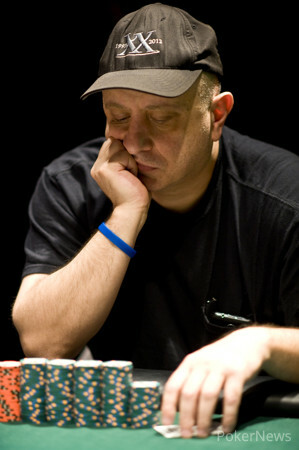 Hand #105: Roland Israelashvili shoved on the button for about 2.3 million and took down the pot. Hand #106: Brian Yoon raised on the button to 325,000 and Justin Zaki three-bet to 850,000 from the big blind. Yoon four-bet shoved and Zaki called all in for about 3.4 million with , racing with Yoon's . The flop came down , pairing Yoon and leaving Zaki drawing thin. The turn was no help to Zaki, nor was the river, ending his run in fourth place. Hand #95: Brian Yoon took the pot with a preflop raise. 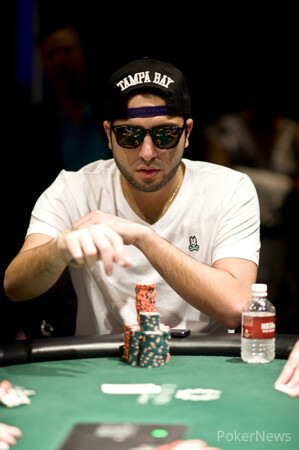 Hand #96: Justin Zaki raised to 325,000 from the button, and he took the pot. Hand #97: Yoon raised to 350,000 from the small blind, and Cuong Van Nguyen came back with 1,050,000 in the big blind. Yoon let it go. Hand #98: Yoon took it down with a raise to 350,000 from the button. Hand #99: Zaki raised to 400,000 from the small blind. He won the pot. Hand #100: Roland Israelashvili jammed from the small blind, and Yoon folded. Hand #101: Yoon raised to 350,000 from the small blind, and Van Nguyen called him. The flop came , and Yoon took the pot with a continuation-bet of 350,000. Hand #102: Zaki got a walk.